An eggshell finish has a low sheen -- somewhere between satin and semigloss -- similar to the sheen on an actual eggshell. To get the most from your eggshell paint, it's important to apply it generously, but not so generously as to produce drips and sags. It's crucial to keep the roller sleeve loaded so you don't have to press too hard to squeeze out paint. The type of roller cover you use is important, as is the direction you move the roller on the surface you're painting. Finally, it's always a bad idea to expect perfect coverage from a single coat. You'll get the best results if you plan on two coats, even for subtle color changes. The secret to stroke-free painting is to keep your roller loaded. Roller covers come in a variety of materials and naps, and each has its ideal use. Short-nap rollers, for example, are better suited for flat paint than gloss or semigloss paints, whereas foam rollers should be reserved exclusively for applying oil paints and enamels. The best roller cover for eggshell finish has wool fibers and a 3/8-inch nap. Longer naps are best for textured finishes, but in a pinch, a 1/2-inch nap is also an acceptable choice for applying eggshell. It's natural to try to squeeze as much paint from your roller as you can before reloading, in an effort to save paint, but that strategy is likely to produce paint ridges. To get a stroke-free eggshell finish, you should never have to apply more than moderate pressure to the roller. That means reloading more often than you would if you were applying primer or a flat finish. When loading from a paint tray, keep enough paint in the tray to be able to cover the roller at least halfway. That way, you won't have to press into the tray to get paint on the roller. When applying flat paint, you can roll horizontally, vertically and diagonally, and the final results will be about the same. That's not true when you apply an eggshell finish. You should roll in one direction only, preferably from floor to ceiling. Don't back the roller up when you finish a course. Instead, bring the roller back to its starting point so you can apply the next course in exactly the same way. Never stop painting in the middle of a wall. Instead, be sure to paint to the end before taking a break. Paint the areas above windows and doors with horizontal strokes, and then repaint those areas with short vertical ones. Do the same beneath windows. It's important to work systematically, so that one half of the roller passes over wet paint whenever you roll. If you work haphazardly, jumping from one area of the wall or ceiling to another, the paint you apply might have a chance to harden before you cover the edge with more paint, and this can leave ridges that you might not notice until the paint dries. To keep a wet edge near the corners of a wall or ceiling, cut in with a paintbrush just before you roll. The paint you apply with a brush should still be wet when you roll over it. It's important to apply an eggshell finish generously, but it's also important not to overdo it, or you'll end up having to sand out drips and sags. To avoid sagging, don't expect to get complete coverage with a single coat. 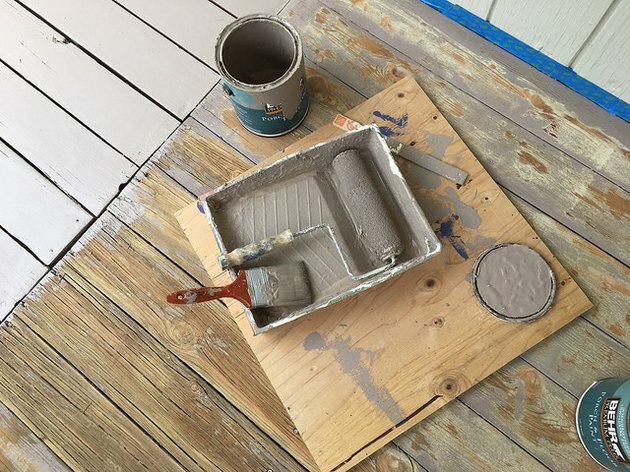 You'll get the best results if you apply one coat, wait for it to dry, then scuff it with 150-grit sandpaper before applying a generous second coat. This may require more paint, but the results are worth the extra expense. After the second coat has dried, shine a work light on the surface you just painted, holding the light at an oblique angle to highlight any defects. Hopefully, you won't find any, even after changing the position of the light. If you see one or two ridges or holidays -- which are areas with insufficient paint coverage -- you can usually touch them up with sandpaper and a brush. A large number of defects may warrant another complete scuffing of the surface and the application of an additional coat. If you've painted with a well-loaded roller, however, the chances you'll need an additional coat are slim. How Many Coats of Primer and Paint Do I Need?